﻿ 5 Reasons Why Repeat Customers Are Better Than New Customers » Red Mango Marketing! When your business needs to increase revenue, where is the first place you look? If you’re like many businesses, you focus the bulk of your time and budget on acquiring new customers. While new business is an important part of creating a profitable business, it’s probably not the best use of your time and money. What if you spent more time focusing on your most valuable resource? Concentrating on customer retention and encouraging repeat customers creates long-lasting, profitable relationships. 300 percent more, according to RjMetrics. Not only are your repeat customers purchasing more over time than new customers, they likely trust you enough to purchase your more expensive products or services. You have limited time and resources; you don’t want to waste them on potential customers who never end up buying anything. Keep in mind, when you’re marketing to a prospective customer, you only have a 13 percent chance of persuading them to make a purchase. However, things change when you market to a repeat customer. Repeat customers have a sixty to seventy percent chance of buying. Don’t waste time spinning your wheels without getting results. If you’re a small business, you need to save money anywhere you can. It costs five times more to acquire a new customer than it does to keep a current customer. Bringing that new customer to the spending level of your current customers costs 16 times more. Spend your limited money where you know it will get the most impact. And hiring brand ambassadors? Nearly impossible for most small businesses. But what if your ambassadors didn’t cost you a penny? By focusing on repeat business, you’ll create a group of loyal customers that will happily say your praises and promote your business. Repeat customers refer 50 percent more people than one-time buyers. Hint: Attract referrals through email marketing with our five-step method. Your business shouldn’t be a revolving door of customers. By increasing customer retention just five percent, a company’s profitability will increase by an average of 75 percent. When you imagine future success, picture strengthening existing relationships rather than forging new ones. After all, 80 percent of future profits come from 20 percent of current customers. Investing in repeat business costs you less and makes you more. The result? Your business prospers with less stress and effort. How can you start driving repeat business? Email marketing is the easiest way to reach your existing customers and encourage them to shop with you again. Learn how small businesses use email marketing to drive repeat business. Want to try email marketing for yourself? Sign up for a free, 60-day email marketing trial here. 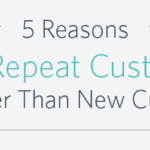 The post 5 Reasons Why Repeat Customers Are Better Than New Customers appeared first on Constant Contact Blogs. This entry was posted on Monday, May 22nd, 2017 at 11:00 am	and is filed under Business Tips, Email Marketing, Fresh Insights, News & Updates. You can follow any responses to this entry through the RSS 2.0 feed. Both comments and pings are currently closed.